Enjoying a healthy, balanced diet during your pregnancy will ensure your unborn baby gets the nutrients they need to grow healthy and strong. Read on to find out what’s considered ‘healthy’ when it comes to your pregnancy diet. Sustaining a healthy pregnancy diet can be made easier if you plan the specific nutrients and calories you should be eating according to your pregnancy stage and BMI. Here’s a step-by-step general nutrition guideline on the foods you should and shouldn’t eat, as well as some simple recipes to include in your pregnancy meal planner. Why is a balanced diet so important during pregnancy? A balanced healthy diet is crucial for good health, especially when you’re pregnant. Getting the right nutrition is one of the best ways to give your baby a head start in life. A balanced diet during pregnancy needs to include a variety of healthy foods from each food group, which includes whole-grains, vegetables, fruits, protein like fish, poultry, lean red meats, beans and low fat calcium-rich dairy foods, which are all vital ingredients in your healthy pregnancy meal plan. Your body now needs additional nutrients to support the growth and development of your baby, but this does not mean you should be eating more. Your body becomes more efficient at absorbing nutrients while you’re pregnant which allows you to start building stores of vital vitamins and minerals. This means that your body can naturally achieve the levels required for both you and your baby without increasing your food intake. During your pregnancy, nutrition is a vital part of preparing for your new baby. A pregnancy “healthy plate” style is a simple guide to help you get all the nutrients you and your baby need. 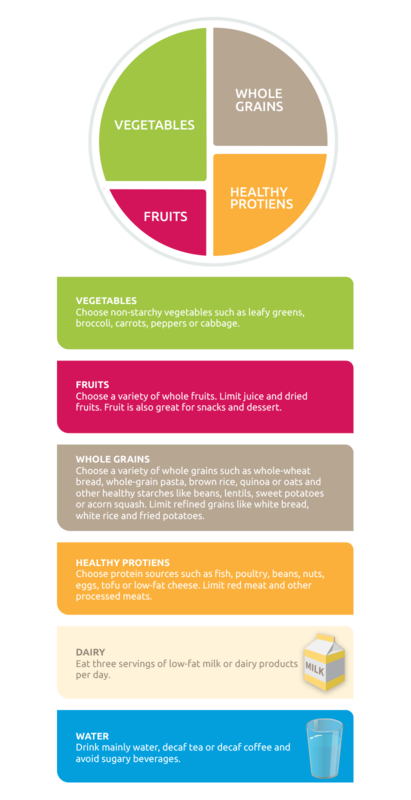 Take a look at the diagram and check the foods you should include in your daily meals. Follow our guide for choosing nutrient-dense foods to help you through each stage of your pregnancy. We will help to explain how you and your baby can eat healthier every step of the way through our pregnancy meal plan. Your first trimester diet should be rich in folic acid, which is great for your baby’s developing nervous system. Broccoli, spinach, citrus fruits, asparagus, beans, peas, lentils, avocados, seeds, nuts, carrots and celery are all sources of folic acid. Iron is also important for pregnancy. Red meat, poultry, dried fruits (apricots and peaches), fortified cereals and fish are some of the best sources of iron. If your diet doesn’t include animal protein, you can get iron from legumes, vegetables, and grains. We show you how you can include these ingredients in soups, salads, sandwiches and snacks, in our 1st trimester meal planner. 1 cup of iron-fortified oatmeal. 1 cup of vegetable soup such as spinach, green peppers, tomatoes etc. Salmon, mackerel and other oily fish such as tuna, sardines as well as cod liver oil. Broccoli, okra, beans, lentils and almonds. Avocados, figs, bananas and spinach. During the third and final trimester of your pregnancy, your baby grows quickly. Their eyes, bones, organs, brain and lungs are developing and their nutritional needs are increasing. In addition to this rapid growth, your body is preparing to give birth. A healthy diet, packed with nutritious foods, is just as important now as it was during the first two trimesters of your pregnancy. In addition to your basic diet needs, you’ll need an extra 200-300 calories a day during your third trimester. These are simple example foods you can eat to increase your calorie intake. There are lots of other foods for you to try, but make sure they don’t increase your intake too much. Adding dried apricots, apples, almonds and other fruit, raw vegetables and nuts to the above suggestions can increase your calorie intake. But don’t forget, your body is adapting itself to the pregnancy and is absorbing more calcium from the foods you eat in order to strengthen your baby’s bones. This means you don’t have to eat more, you should just eat more calcium-rich foods. So as well as dairy foods, and other non-dairy food, good sources of calcium include dark green leafy vegetables such as broccoli, collard greens, kale and okra, canned fish like salmon and sardines, raw almonds, dried apricots and figs, sesame seeds, white beans and fortified orange juice. Try to also eat at least 2 cups of fruit, 3 cups of vegetables, and 8 oz. of whole grain bread products a day. You’ll need 6.5 oz. of protein from lean meat, poultry, beans, nuts or eggs every day and at least 3 cups of low-fat milk or yogurt. The meals in the 3rd trimester meal planner help you achieve these objectives. Raw or partially cooked meats, fish and chicken, because there could be a risk of contamination with coliform bacteria, toxoplasmosis and salmonella. Raw or undercooked eggs; that includes any foods that are made with them too (such as mayonnaise, certain ice creams and some home-made mousses). Liver and products made with it, such as liver pate. Fish that contain high levels of mercury, such as shark, swordfish and tuna (big eye). Mercury consumed during pregnancy has been linked to developmental delays and brain damage. Smoked seafood because it could be contaminated with listeria. The recommended daily limit for caffeine is 200 mg. This means 2 mugs of coffee or tea a day. Caffeine is found in coffee, tea, some sodas and chocolate. Remember to consult your doctor if you are unsure of what you can or cannot eat. Supplements: Should or shouldn’t you? Some nutrients are more difficult to get from foods than others. For example, vitamin D is vital for strong and healthy bones. Egg yolk, oily fish, breakfast cereal and vitamin D fortified food provide us with vitamin D. Natural sunlight does too – through our skin. However, be careful about how much time you spend exposed to the sun, especially in our climate. Overexposure may result in pigmentation issues, especially during pregnancy. Ask your doctor about how long you should stay in the sun, just in case. Supplements help to increase your intake of vitamin D. But before you decide anything, you should consult with your doctor first.